The Rachel Sandwich + Call for Recipes: Sandwiches! I looooooove sandwiches. I can eat them for breakfast, lunch and dinner. I don’t know what it is, but they hit the spot! I really like making sandwiches for dinner because they are simple and quick but are (or at least can be) filled with all kinds of balanced goodness. And in the summertime, when the last thing you want to do is turn on the oven or stove, sandwiches are a really great dinnertime option. 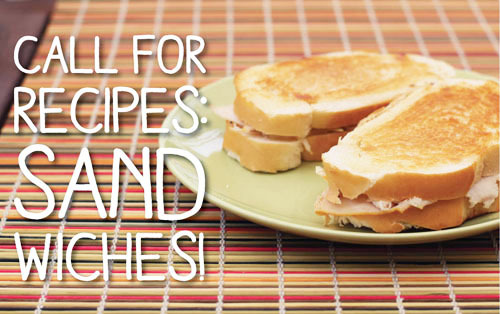 Since summer is here and since I love sandwiches, I have decided we need to do a sandwich Call for Recipes! Share your favorite sandwiches, whatever they may be…hot, cold, easy, complicated, open-faced, closed-faced, silly-faced, anything! Feel free to link to recipes or just give a quick description of how to make the sandwich. Let’s put together a long, fabulous list of sandwich options for us all to choose from. I know you can deliver! I’ll kick us off with the Rachel. I think it is safe to say this is my favorite sandwich. My friend Jami introduced them to me years ago in Cambridge, MA at a little deli near our work. I was hooked at first bite, and the great thing about the Rachel is that it is completely replicatable (new word alert!) at home. My Rachel sandwich is as good as any Rachel sandwich I’ve had in any restaurant. Your turn! Share your favorite sandwiches! Ready, set, GO! 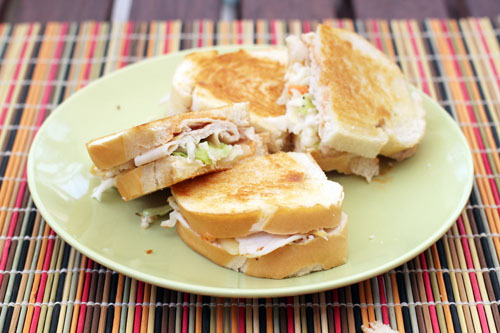 Spread dressing on both slides of bread, top with cheese, coleslaw and turkey, then put sandwich together. Butter outsides of the bread (or add butter to the pan) and grill in a frying pan on both sides until golden.